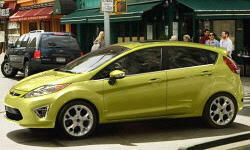 Why the 2011 Ford Fiesta? Holds the road well in corners, feedback from the road is good without feeling overly harsh. Best fuel economy in class. 38mpg highway, without complexity of hybrid power train. Comes with 7 air bags standard, IIHS top safety pick, ABS and enhanced stability control standard, SYNC can call 911 in an emergency. I liked the available SYNC system, dual-clutch 6-speed automatic transmission, heated seats, keyless intelligent access and push-button start. It looks sharp! The headlights, curves, and overall shape make it look sporty. Why Not the 2011 Ford Fiesta? Rear seat legroom is limited, especially if front seat passengers adjust their seats rearward. The dealership experience was mixed. One seemed very disorganized with respect to the Fiesta, unable to locate stock in transit or estimate arrival times - unwilling or unable to locate and obtain model from another local dealer. Other dealer was better.